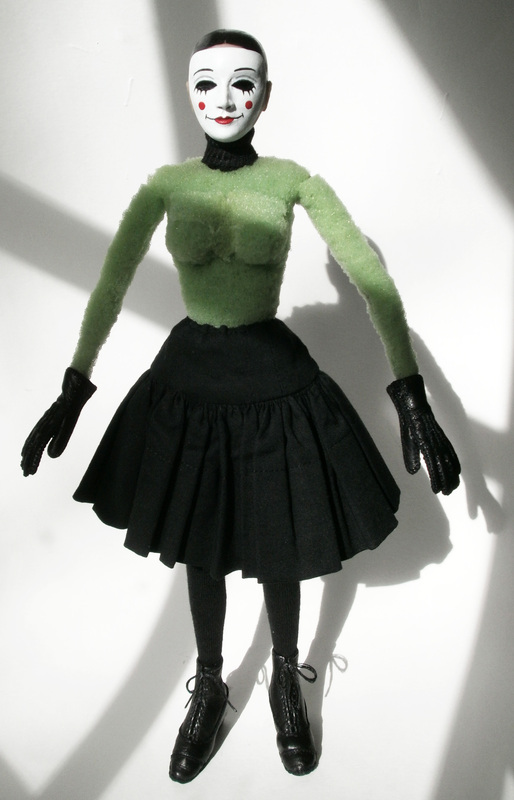 This week I made the pattern for the puppet’s coat and made her petticoat. I made the red corduroy coat that will by worn by the live action character and still have the pattern. To shrink the pattern to the correct size for the puppet, I taped a piece of paper in the middle of the full sized pattern and put a thumb tack in the middle of the paper from the bottom to use for my fixed point. 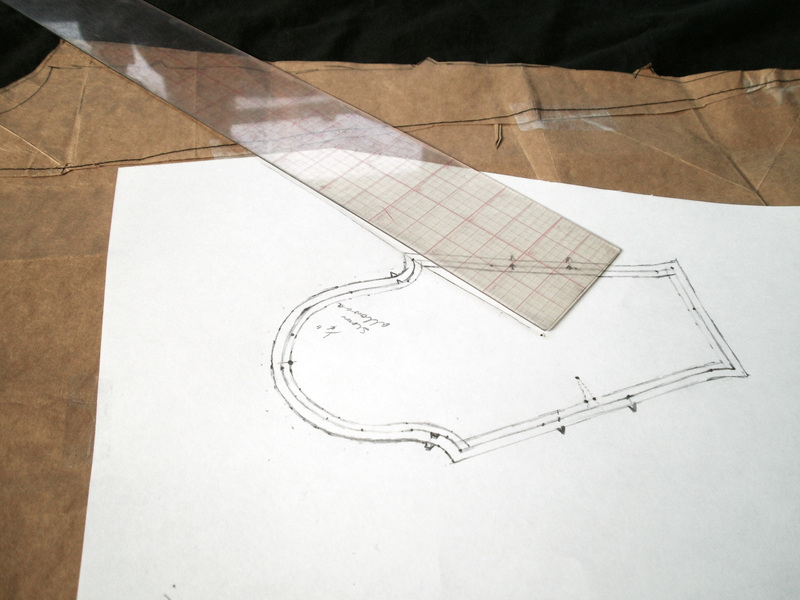 Then lining my ruler up with the fixed point and extending it to a part of the pattern I took the measurement and divided it by 5.33. That is the equation I have been using all along for this puppet and it was determined by the puppet being 12 inches and the live action character being 64 inches. Divide 64 by 12 and you have 5.33 (Actually the 3s go on and on but I stopped at two.) My other option would have been to multiply the measurement by .1875. Once I have worked out the reduced measurement, I mark it on the line between the fixed point and the place I took the measurement on the pattern. 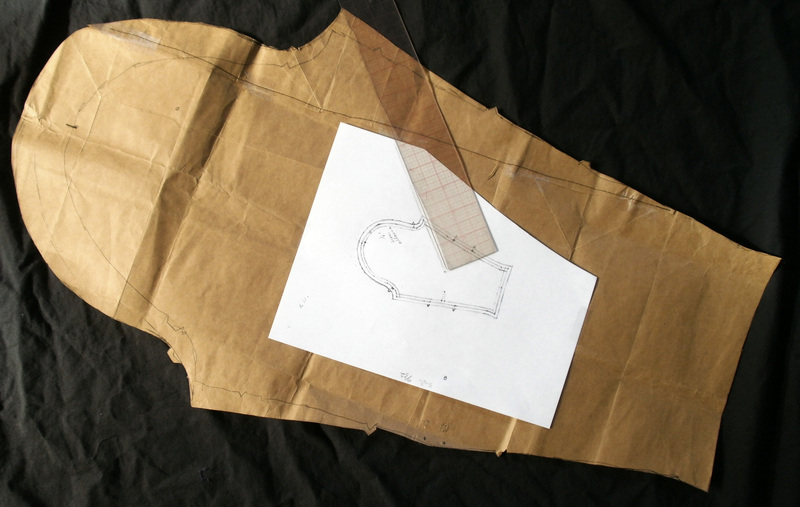 I repeated the process for every corner and pattern marking and at intervals along the edge. Here is a photo to illustrate. The center line is the one that correlates with the pattern. You can see the dots where I took the measurements. The inner most line marks the seam line and the outer line is what I added to have enough seam allowance to sew the miniature together. Here you see the ruler lined up with the central fixed point and the pattern. The extra seam allowance is there too. 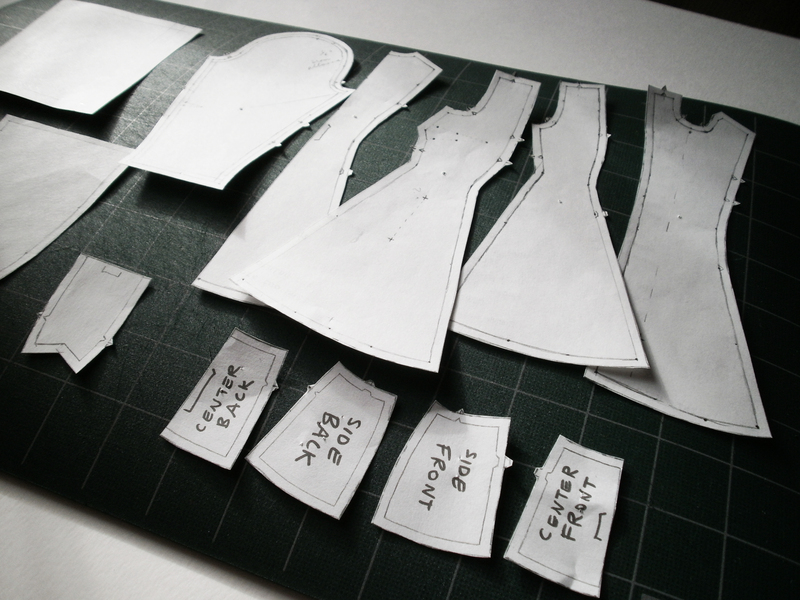 The 5/8 inch seam allowance of the full sized pattern comes to just under 1/8 inch on the miniature. I added another 1/8 inch so I can have a 1/4 inch seam allowance to work with. I adapted the full sized original from another pattern using the inside of a grocery bag. I’ve used many grocery bags this way but since I mostly use my cloth bags now I’ve had to buy a roll of craft paper to make my dress patterns on. Here are the completed pattern pieces on my cutting board. The lines on the board are one inch apart. Amazing, I love the details!